When The Chamberlain Group, Inc., designed the push buttons for its Lift Master Mini Remote ? 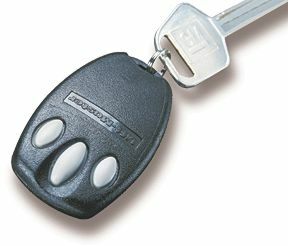 the world’s smallest and lightest garage door remote control ? it needed a durable material that molded well over Cycoloy® ABS. Its molder, PTA Corporation, recommended Pellethane® polyurethane thermoplastic elastomer and called on RTP Company for a perfect color match. The gray elastomer complements the black housing while maintaining its appearance after repeated exposure to skin oils. "RTP Company came through with a critical color match using the 70A material ? the lowest durometer Pellethane® grade available," explained Tom Brookbank, Marketing Director for Chamberlain. "It not only looks good, but also offers us high strength and resistance to abrasion and tearing." Soft elastomers do not break on impact and can elongate several hundred percent. In this application, the Cycoloy® case front and back are molded in a family mold. The case front is inserted into a second mold and overmolded with Pellethane®. The two materials are chemically bonded, resulting in a durable part with a soft touch. Push buttons, key caps, tool handles, gaskets, cosmetic cases, and many other parts benefit from this innovative molding technique. PTA Corporation, headquartered in Oxford, Connecticut, produces several overmolded applications. "We’ve used Pellethane® for other applications and knew its adhesion to Cycoloy® was extremely good," said Rich Dorans, General Manager with PTA. "During the development stage, RTP Company supplied us with a variety of grades and durometers. We sampled several grades of Pellethane® so Chamberlain could evaluate and select the grade that had the right touch and feel. RTP Company Ð as usual Ð provided us with excellent turnaround, and their service was exceptional." Chamberlain’s revolutionary Lift Master Mini Remote was introduced at the 1997 hardware show in Chicago, and unit sales have soared. "Pellethane® has provided us with the opportunity to offer a true moisture resistant Ômini’ transmitter to the consumer," confirmed Brookbank. ® Pellethane is registered trademark of Dow Chemical. ® Cycoloy is a register trademark of General Electric.